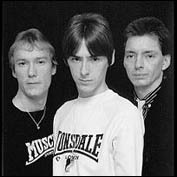 LONDON (CelebrityAccess MediaWire) — Punk/mod band The Jam is regrouping for a tour to mark the thirtieth anniversary of the drop of the band's first album "In the city" which debuted in 1977. Well, two thirds of the band at least. Bruce Foxton (backing vocals & bass) and Rick Buckler (on the kit) are heading out on the road for a 20 date tour in the UK. This will be the first tour for the band in over 20 years. Paul Weller (lead vocals & guitar) will apparently not be joining the tour. He has been a vocal critic of such a notion, stating during a 2006 interview that a reunion would "never happen" and that such reunions were "sad" adding that "Me and my children would have to be destitute and starving in the gutter before I'd even consider that"
His mates didn't get the message though. The band, hugely popular in the UK never quite made the jump to the US but they still have a strong following among fans. In their heyday, they charted 18 straight top 40 hits including four #1s between their formation in 1977 to their dissolution in '82.